Most SUN neighbors will see a sign on their street like the one pictured to the right. To park on the street between 8AM and 8PM on all days except Sundays and holidays, you will need either a Residential Sticker Permit for a car registered at your address, or a Guest Placard Permit which can be used on any car. Cars owners not displaying a permit are subject to a $65 fine. You can apply for Residential Sticker Permits for up to three cars, and up to two Guest Placard Permits. Each permit costs $35 a year, and expires at the end of July. To apply, fill out a SUN Residential Parking Permit Application. You will need proof of residency issued in the last 90 days (tenant verification form, home telephone or utility bill, current vehicle registration, or current property tax bill), current DMV registration for each vehicle if applying for a Residential Sticker Permit, and valid photo identification. You can either copy all the documents and mail them in with a check to Residential Parking Permits Office, 200 E. Santa Clara Street, San Jose, CA 95113, or go in person, pay with cash, check or credit card and get the permits on the spot. Temporary single use permits are available for short-term special events, such as birthday parties, not to exceed seventy-two (72) hours. To discuss specific permit needs, contact the Residential Parking Permits Office at (408) 535-3850 or email dotpermits@sanjoseca.gov. 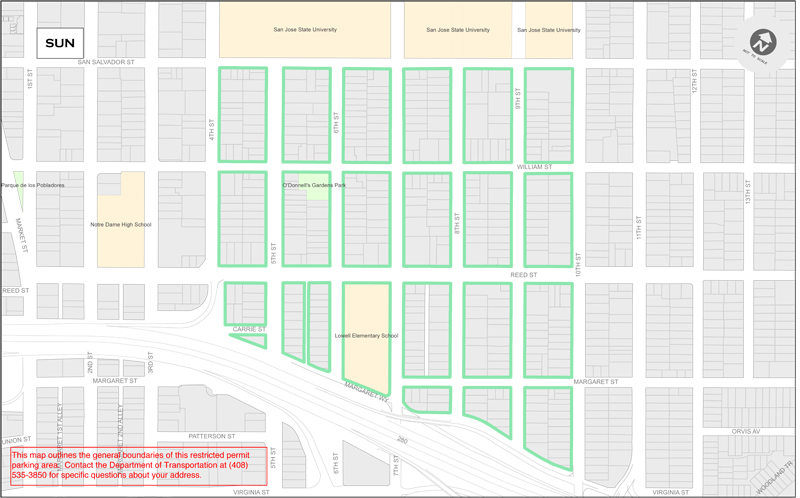 Blocks subject to SUN permit parking are marked in green below. San Jose State University charges students to park, so before residential permit parking went into effect students would seek free parking on neighborhood streets. This made it all but impossible for residents to find street parking when classes were in session.